After many millennia, Hypnos is leaving the throne. Now it belongs to the Morpheus, Hypnos' right hand and son. Morpheus must make sure that dreams leave Oniria to the world and minds of mortals at the same rate as to this moment, otherwise Earth is doomed to regress of thinking and Oniria - to annihilation. Mortals need dreams to think, remember and simulate their imagination, Oniria needs sleeping humans to exist - without dreamers Oniria will be left without power. But Morpheus cannot rule Kingdom of Dreams and create dreams and send them alone. That is why he needs an assistant. He makes a competition - Dreamweavers have three months (this is rather foggy, time in Oniria works - like most things - differently than in the mortal world) to weave the most dreams with the most powerful oniric energies - the best weaver will become Morpheus' right hand, and simultaneously second most powerful creature in Oniria. 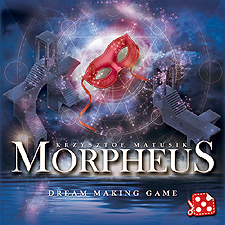 Morpheus is a game for 2-4 players in which players will create dreams. At the beginning of each turn, the active player rolls the dice. Then, players will choose the dice and according to the number they will get different gifts, with essence among them. After that, at certain locations Dreamweavers can assign the essence to dreams and complete them. Dreamweavers will travel through the land of Oniria exactly three months of game time, which equals 21 turns. The player who creates the most powerful dreams and collects the most victory points wins the game and becomes right hand and assistant of Morpheus.